Pearls and booze and glares. 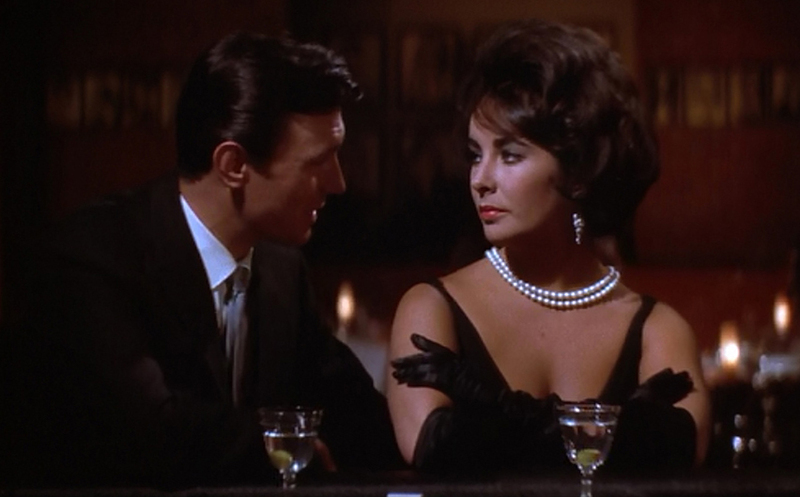 Elizabeth Taylor and Laurence Harvey in BUtterfield 8. 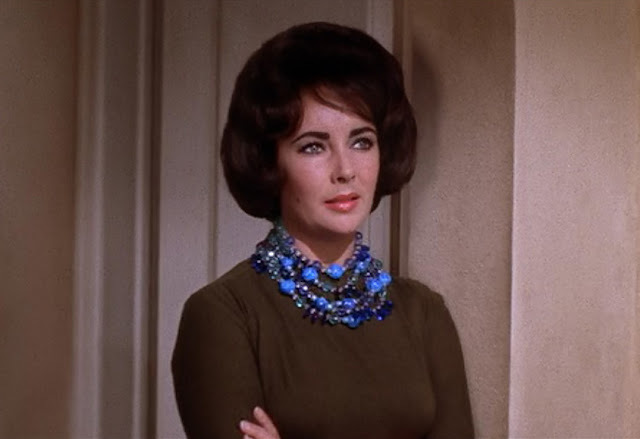 When I rewatched BUtterfield 8 recently I was struck by how many pearl necklaces were on the actresses. I do think every lady in the movie had one on! 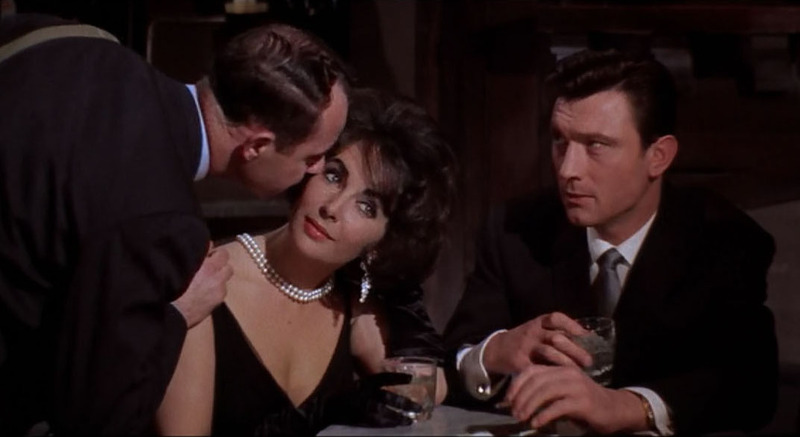 In the film Elizabeth Taylor plays, according to Netflix, “Gloria Wandrous, a stylish call girl who yearns to go straight, especially after she thinks she’s found Mr. Right.” Mr. 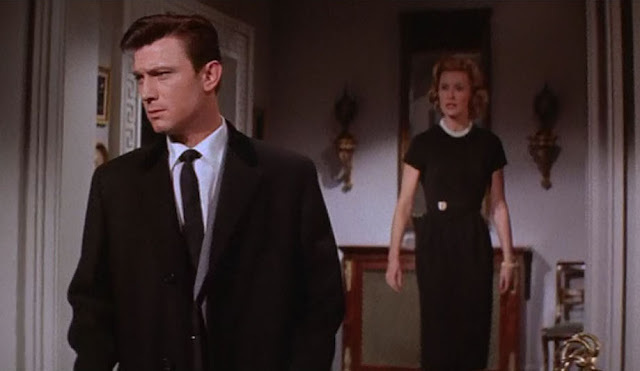 Right refers to Weston Liggett, played by the foxy Laurence Harvey. Gloria’s friend Steve is played by Eddie Fisher, Liz’s then-husband (Number 4), and rounding out the all-star cast is Dina Merrill, who plays Emily, Liggett’s wife. The costumes were by Helen Rose and they were divine! Check out these great looks on Liz and Dina! Liz and Dina about a block from the Met. Since there were pearls on all the ladies throughout the film I started noticing and loving the sly use of them and how they help define each character—a demure single strand of small pearls on Norma, Steve’s girlfriend (Susan Oliver), two strands with a diamond clasp on Dina (and I’m betting they were real), playing a Manhattan socialite, and three strands on the older and wise-cracking neighbor Mrs. Thurber (Betty Field). A delicate single strand on Susan Oliver, who plays Norma. Double strand on Dina (and I love the colors of her dressing area!). A closer shot of the necklace on Dina, worn with pearl and diamond earrings. A graduated strand on Emily’s mother, played by Carmen Mathews. 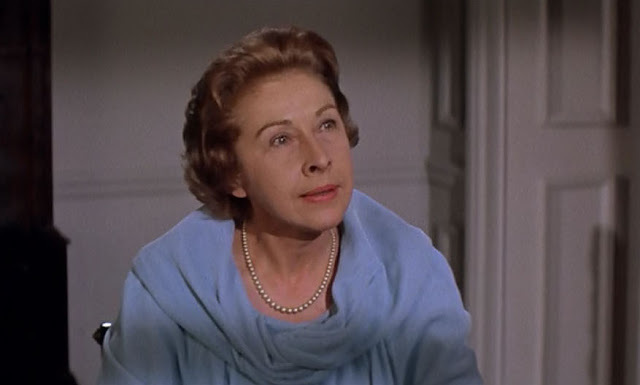 Three strands on Betty Field as Mrs. Thurber. The pearls on Liz were grand as well—two-strands, also with a diamond clasp, that she wears slightly draped down her back in the scene where she pairs them with the black satin cocktail dress with black gloves, which is such a great look! Love how these drape across Liz’s back. A peek at the long sparkling earring to accompany the pearls. Laurence’s look here cracks me up. Love this shot of Liz pouring bubbles for all! 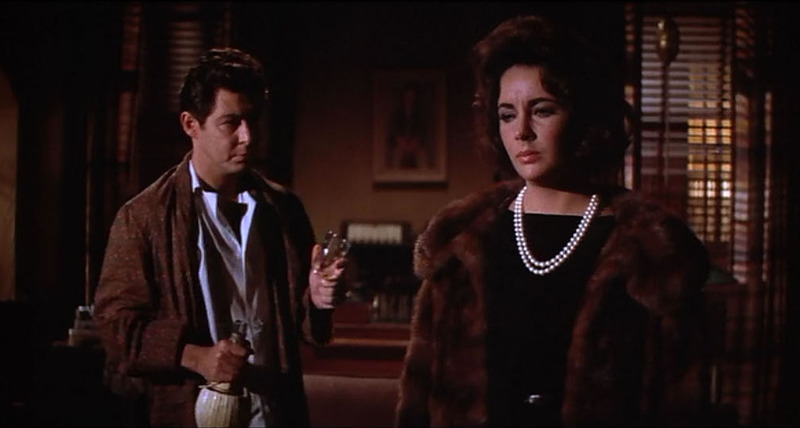 Liz wears the necklace again later with the fur coat she lifted from Dina’s closet at the beginning of the movie, but this time she wears the pearls in a more traditional way. What I particularly love about this entire costume is that Liz’s character is dressed in something that Dina’s character would wear, but she has none of her wealth or social status. This is modern day costuming at its finest, done so subtly and so well. I know nothing of these necklaces—I would not be surprised if some of the actresses (especially Liz and Dina) actually owned the strands they wore and they were real—so if you have insight, do share what you know in the comments section. 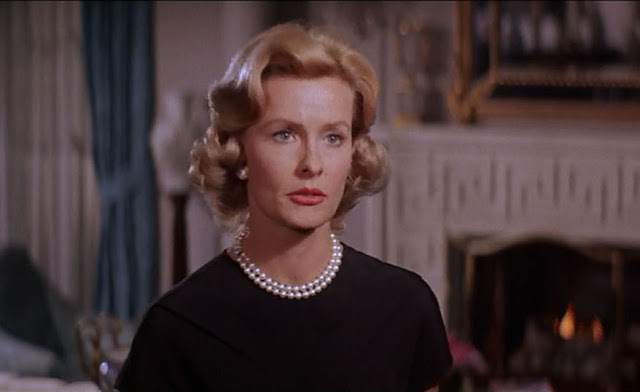 Strands of pearls were such a part of the look in the 1950s and early 1960s that I probably shouldn’t be surprised to see so many of them, but this may be the first film I’ve watched where nearly every female character wears them at one time or another! Blue necklace on Liz and yet another strand of pearls, this time on Kay Medford. Another jewelry look I loved included this fantastic blue necklace on Liz, which was amazing next to that olive green and was gorgeous with her coloring. Such a great necklace on Liz! Note the diamond brooch at Dina’s waist. Let me know what you thought of BUtterfield 8, if you’ve seen it, as well as your take on the pearl necklaces. Make mine either a long double strand, like what Liz has on, or a shorter choker length, like Dina wears! :-) I think this is such a good movie, don't know how often I've watched it. One of the great things are the costumes and the set. Now that you mention the pears….yesssssssss! 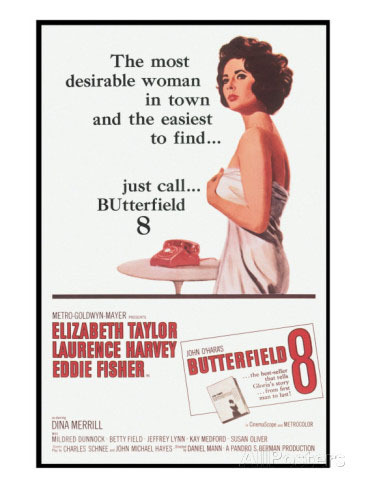 I love Butterfield Eight. Liz was so beautiful wasn't she? I don't think I realized that until about ten or fifteen years ago. Growing up in the late sixties and seventies, I saw her as the characters she played in Who's Afraid of Virginia Wolfe? and guest roles on Dallas or Dynasty. But one year when my husband was away fishing I rented Cat on a Hot Tin Roof and I was hooked. 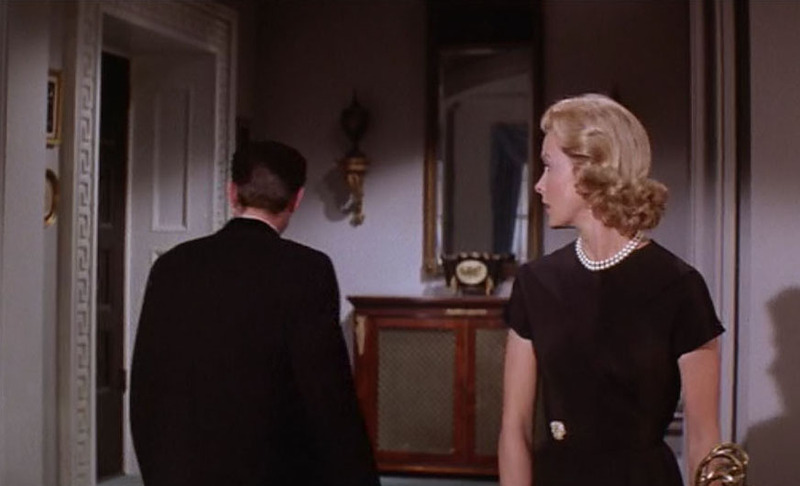 How clever of you to spy the pearl motif in the film. Just about every woman or young lady had a least one set of pearls and probably pearl earrings in the 50's and early 60's. Pearls declined in popularity in the mid to late 60's and then saw a resurgence I believe in the 80's. This is a terrific movie with great acting. I think the supporting cast of the more mature actresses was particularly good. Laurence Harvey exuded his usual charm, coolness & slight (maybe not so slight) boredom in his voice and persona. Well, Liz was at the height of her beauty (only 26) & still reeling from the Eddie/Debbie/Liz Scandal. And then the really big scandal with Burton was about 2 years away. I love the pearl discussion. I have been "hooked" on old Perry Mason reruns. The costumes and hair are absolutely divine (especially just watching Della's changing styles ever day), but I was surprised to notice the women ALL wear pearls. There is never a day when a female character is not wearing the. And they are lovely to watch. These are late 1950s through the 60s. fabulous. What a wonderful post! You've made me want to watch this again--even just for the pearls and costumes! I've never seen it, and now I'm dying to. Good for you to deconstruct the pearls. I'm sure you must be a fan of What a Way to Go! because of the fabulous Van Cleef jewelry. Be sure to watch it if you haven't seen it. The costumes are incredible! Hi Rosie! Only 26 when she made that movie! Wow. So young, so gorgeous! 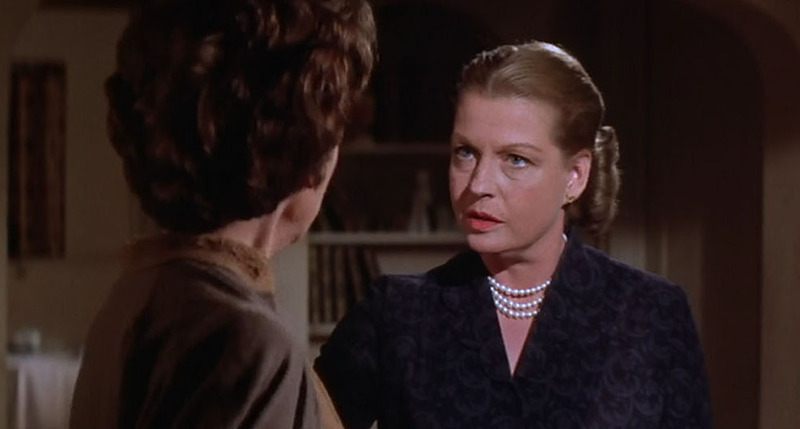 I thought the supporting roles were really done so well by all those older ladies, I loved Kay Medford and Betty Field especially. I read a great article recently that deconstructed the movie by saying that Susan Oliver was a physical stand-in for Debbie Reynolds and the entire film was a way of Liz getting her comeuppance for "stealing" Eddie Fisher away from Debbie. Ha, I don't think so, but it was a fascinating piece. I think I found it over at Salon.com. Hiya Poppy! You know, that movie was just on about a month or two ago and I have only seen snippets. But Van Cleef did you say? I'm there!!! I will add it to my Netflix queue. When reporters were going gaga over Liz's beauty in the very early 60's, she actually said she thought Ava was more beautiful. Maybe Liz was being kind @ the time because Ava was starting to show signs of aging due her turning 40, but mostly because of her hard partying drinking & brawling. They were more than a decade apart age-wise. Ava said the role that came closest to her real personality was in "Night of the Iguana" opposite Richard Burton - the master of the drinking & hard partying. This is one of Taylor's finest movies in my opinion. I felt there were several similarities to her life that were touched on in that movie. 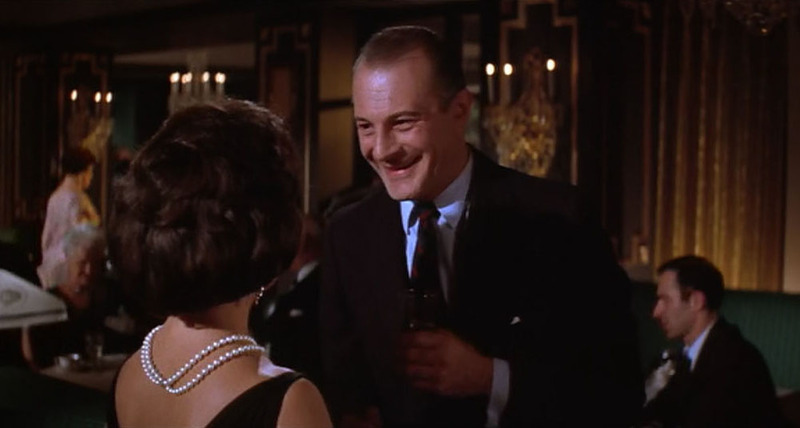 One example is Eddie Fisher's character, who is in love with Taylor but can't seem to get those feelings back. She uses Eddie as a safety as she looks for a better love. Also Eddie's girlfriend reminded me a lot of Debbie Reynolds back then. The good, quiet girl to the bold, outspoken Taylor. The costumes and jewelry were great! I also loved that blue bead necklace paired with the olive sweater. I think her role was worthy of the Oscar she won. A great post! Especially nice with the 5 year anniversary of her passing this week. I have never seen the movie, but by Jove, what an extraordinary beauty she was. I knew that, but seeing these pictures again, remind me of it. Such beautiful features, shoulders... everything. To compliment that which exquisite jewellery....picture perfect. PS because pearls were so hot in the fifties and sixties, I have a little trouble using mine and not look old fashioned. My face is old enough for people to think I got stuck in that period haha.